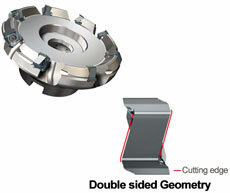 Mitsubishi Materials is proud to announce the introduction of the WSX445 double sided insert type face mill. Features unique proprietary “Double sided, Z Geometry” insert. Designed with through coolant holes. Stainless Steel, High Temperature Alloys, Titanium Alloys, Carbon and Alloy Steels. Designed to control abnormal insert breakage and body damage.